– each track comes accompanied by a short essay exploring the theme. and has a duo project with guitarist Mike Outram ready to release after this. Add to that a touring schedule that has included numerous trips round the UK, Europe and the US, playing mainly ‘house concert’ shows in people’s houses, and it’s clear Lawson’s music life has prepared him well for this collection of new music. Hopefully the listeners will be taken on a similar journey through their own list of things to be grateful for. 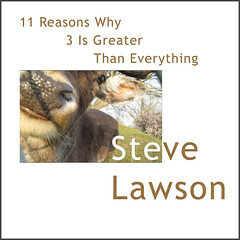 “11 Reasons Why 3 Is Greater Than Everything” features 11 brand new Steve Lawson compositions, and over 80 minutes of music. I look forward to listening to your new music. It sounds as though you are of the mind to make music for music’s sake. I applaud you for that. The idea that the manufacturing of CDs (in which there may be an uncertain demand) is an important factor in distributing your music or any music is a point I’m glad you have raised. Safe travels.